Shake with ice and strain into a cocktail coupe. Garnish with a lemon twist. Two Fridays ago for the cocktail hour, I opened up the new Food & Wine: Cocktails 2013 and found the Turn of the Century by Maxwell Britten of Maison Premiere in Brooklyn. Maison Premiere is an oyster bar with an emphasis on Champagne and absinthe, and from their two dozen absinthes, Maxwell selected Kübler to craft a variation of the 20th Century. 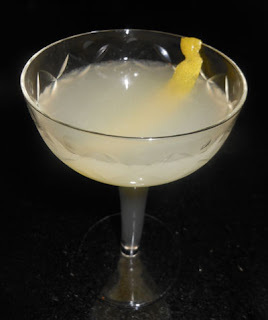 The lemon twist brightened the absinthe's anise aroma and prepared the mouth for the lemon sip that was softened by the Cocchi Americano's sweet wine notes. The absinthe reared itself on the swallow which finished with a hint of cacao at the end. Whether it was the recipe's balance or the choice of Kübler, I was surprised at how the Turn of the Century was rather soft for such an absinthe-forward libation.